Pat Fallon is an internationally know Irish magician and one of the most versatile performers in the country. He is as comfortable performing kids and family shows as he is weddings, festivals, restaurants, theatres, and corporate shows. He can perform anywhere from a table top to a football field. I became interested around Christmas 1981 and turned professional in 1987, so thirty seven years in total and thirty one years as a professional. I saw a magician demonstrating a trick pack of cards in Arnotts, the department store – I was intrigued so I bought a book on magic to find out more. There are many magicians who have inspired me but one of the biggest influences would be Paul Daniels. He was an entertainer first; someone with a real personality. He did more than anyone to make magic popular and part of the public conscience and therefore boosted the value of profession for other magicians. Why do you like magic? I like the diversity of magic – there are so many different genres. I can be entertaining staff at their desks one minute and performing on the street the next. It’s that variety that I love. How many tricks can you do? I know a countless number of tricks. I can probably do 50 tricks with any type of object – from cards and coins to handkerchiefs and rope. It is not really the quantity that is important, it is the quality of what you do that is of the utmost importance. What’s your favourite type of show? I love performing my classical dove act in theatres; however a room full of smiling children enjoying magic at a birthday party is hard to beat. I used to be a professional Jockey. But I’m a much better magician than I was a jockey – that just shows what a terrible jockey I really was! Why do people like magic? Because it’s both entertaining and intriguing – they don’t know how it’s done. It’s the secretive element of magic that keeps it alive, despite what people try to expose on the internet. Any thoughts on magic and the kid’s entertainment industry in general? Despite a changing world, kids still love magic. It’s the wide variety of entertainment available to book in one place that makes PartyWizz different. It makes the whole process so much easier. How important is live magic? With TV magic people often just assume it’s some kind of camera trickery and so can lose faith in it. Live magic is important as the audience knows that what they see is what is actually happening. 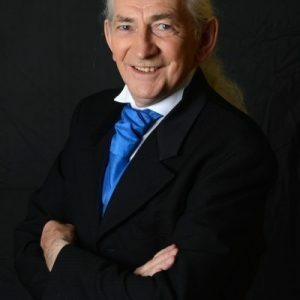 To learn more about Pat, and how to book him to perform live at your own home or venue take a look at his entertainer profile page.